The first impression is captivating: everywhere you look the perspective is extended by the room-high glass frontage. Offering a breathtaking 360° view across the water, the skyline and the old city, every company in this building sits in splendour over the metropolis on the Main. 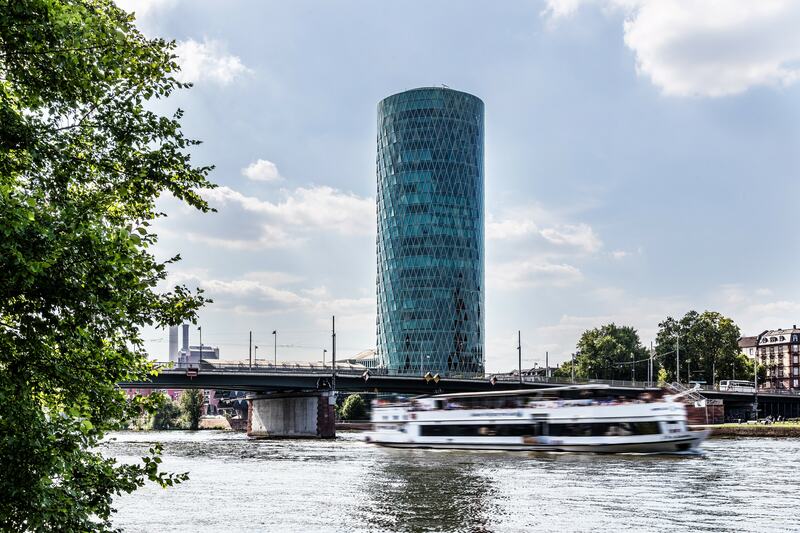 Surrounded by this outstanding potential for growth, the WESTHAFEN TOWER offers you a one hundred percent view of the city and successful businesses. The WESTHAFEN TOWER comprises two additional buildings: Westhafen Bridge and Westhafen House. All three buildings stand out for the timelessness of their architectural expression around the generously proportioned Westhafen Square. The WESTHAFEN TOWER is not only the only skyscraper on the water, but it is the best-known landmark right on the Main. 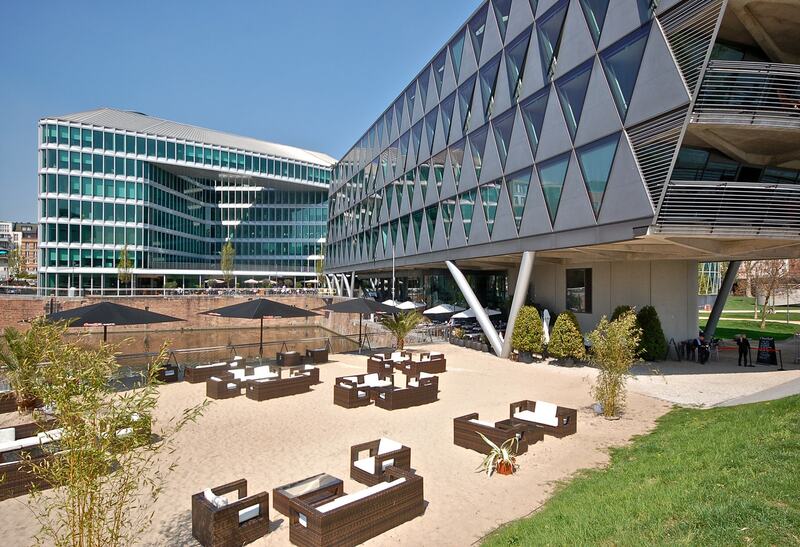 No other high-rise office building is as close to the water or has such an awe-inspiring view stretching from the banking district over Sachsenhausen all the way to the west of the city. 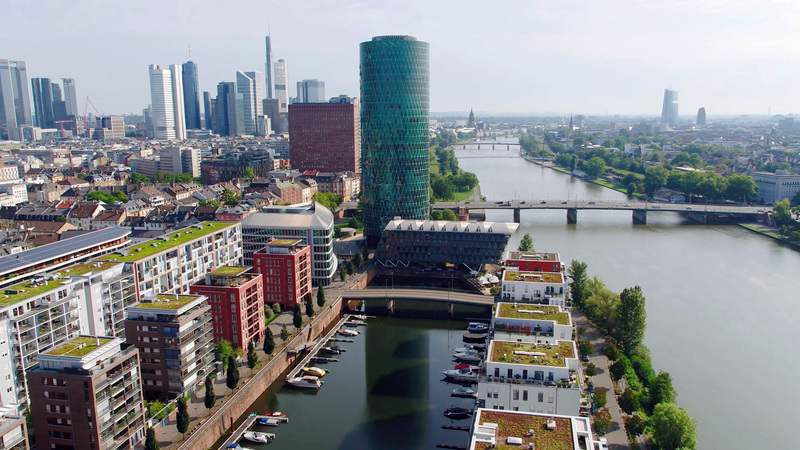 In the next few years Frankfurt’s skyline will continue to grow, but the WESTHAFEN TOWER will remain unique in this location, lending the entire Westhafen district its particular charm. The office premises are the gateway to exclusive residential and commercial complexes with their own marina. When you work hard, you need food to maintain your energy levels and a change of location to relax with others over lunch. There is a great range of international cuisine available within a one-kilometre radius. With seven restaurants in the immediate vicinity of the WESTHAFEN TOWER and just five minutes’ walk from the city centre, you can choose between all kinds of foods and interesting locations. 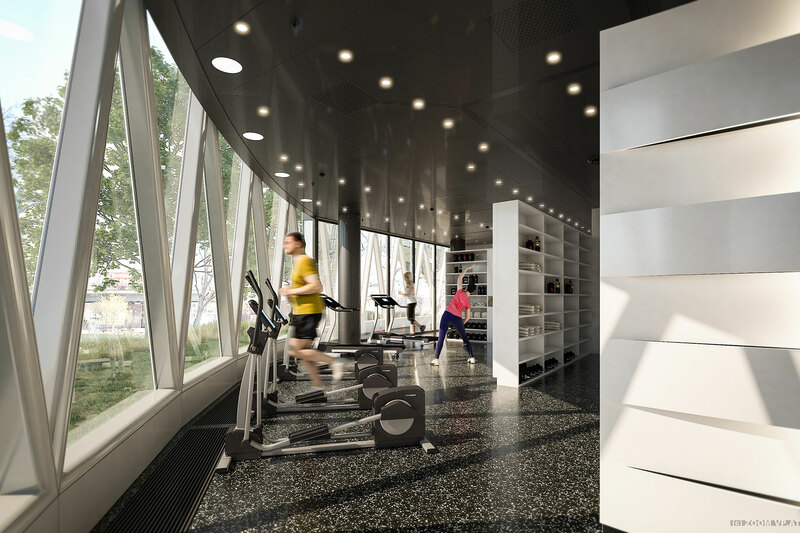 If you want to maintain your performance and stay healthy, you don’t have to go far in the WESTHAFEN TOWER. The building has a new health centre for tenants to use. Word has it that the five minutes it takes to walk to the main station is less time than it takes to get to the platforms once you are inside the station! Alternatively you can walk three minutes to the tram stop on Baseler Platz and get off after just one stop.